Are you a learning disabled person? Want to be part of our exciting Beats project? Beats is steered by learning disabled people. You will beatbox, dj, create digital artwork, plan and present your own club night and more! It is all about learning disabled people getting creative, connecting with the world through digital tech and contemporary popular culture. Beats Crew committee: Benjamin Paior-Smith, James Kurtze, Josh Campton, Locan Hopper, Jianna Georgiou, Michael Hodyl and James Bull with buddies Gaelle Mellis and Amy Milhinch. Check out what the Beats Crew have been doing. We dare you to watch this video. 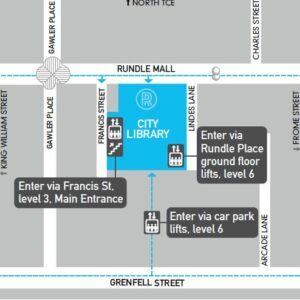 Venue: City Library, Rundle Mall, Adelaide SA 5000 (unless stated otherwise) See image of map below. Check back here for updated workshop schedule. It is free and the Beats Crew would love you to attend.. Beats has been supported through the generous funding of Adelaide City Council.